Susie from the executive office finds the perfect home decor to express her love of pets at the Bank of America Winter Village Holiday Shops. I love animals – especially dogs - particularly poodles. 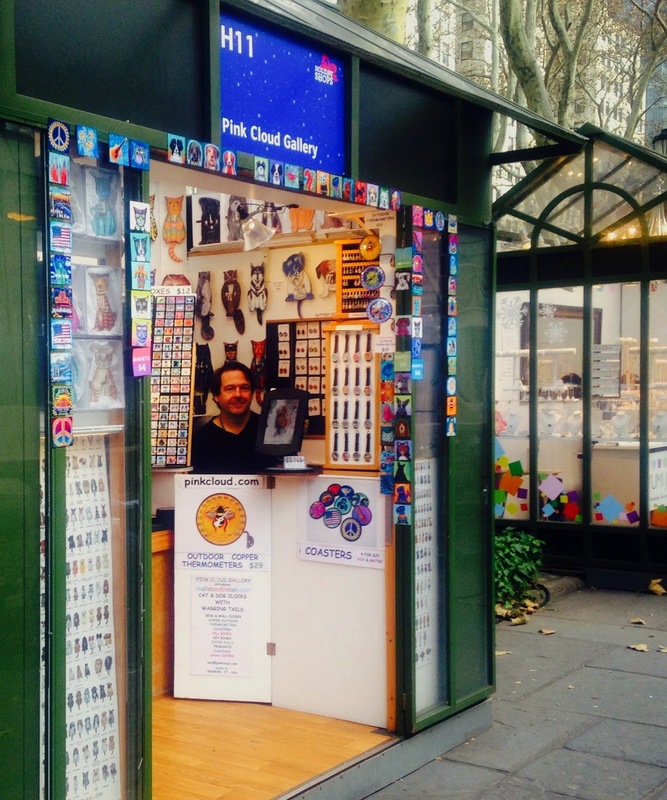 Maybe that explains why I can’t walk through the Winter Village without visiting my favorite animal boutique – ever - the Pink Cloud Gallery (kiosk H11), located on the 42nd Street allée of Bryant Park. 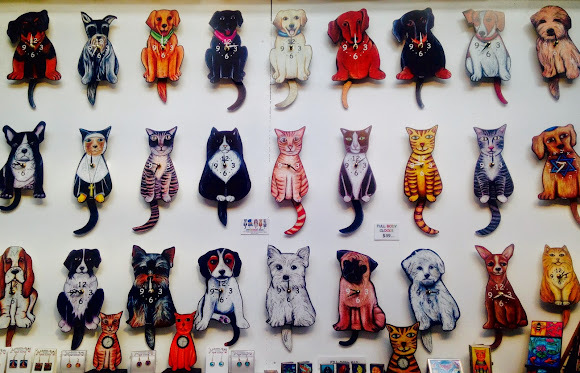 The walls are adorned with wagging tails of hot dogs and cool cats, and the shelves are filled to the brim with colorful, must-have accessories that range from coasters, watches, alarm clocks, night-lights and thermometers, to pill boxes, card-case holders, earrings and key-rings – all with beautifully imagined, colorful imprints. 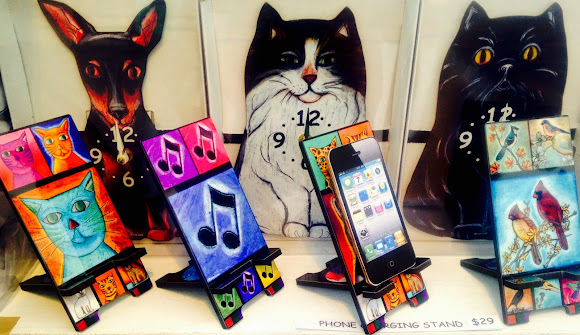 “Everything is “hand-made,” says kiosk owner Peter Hill, “the ole’ fashioned way.” Peter is just one of two artists behind the adorable critters. The other is (you probably guessed already) Peter’s wife, Tara Cafiero, who hand-draws and designs all the original artwork. Peter is more the “nuts and bolts” of the products and concentrates on their nation-wide business. I caught up with Peter on a recent afternoon to ask questions, learn more about the biz, and find out what makes this dynamic duo – and their clocks - tick. Question: How long have you been at Bryant Park? Question: Out of the 200+ designs you offer, what was your first? Question: What is your newest, most popular item? Question: What item is your biggest seller here at Bryant Park? Question: What is the most challenging dog to make? Question: *And your personal favorite item? Peter: “Blue Dog in Hawaiian Shirt”…or maybe “Pug Clock” (with wagging tail, of course)! *Please note that this was not easy for Peter to answer. Of course my answer to this question is “Poodle anything!” (said with great enthusiasm). When they’re not at Bryant Park, you can visit Peter and Tara in the Berkshire foothills at their gallery in Sharon, Connecticut. 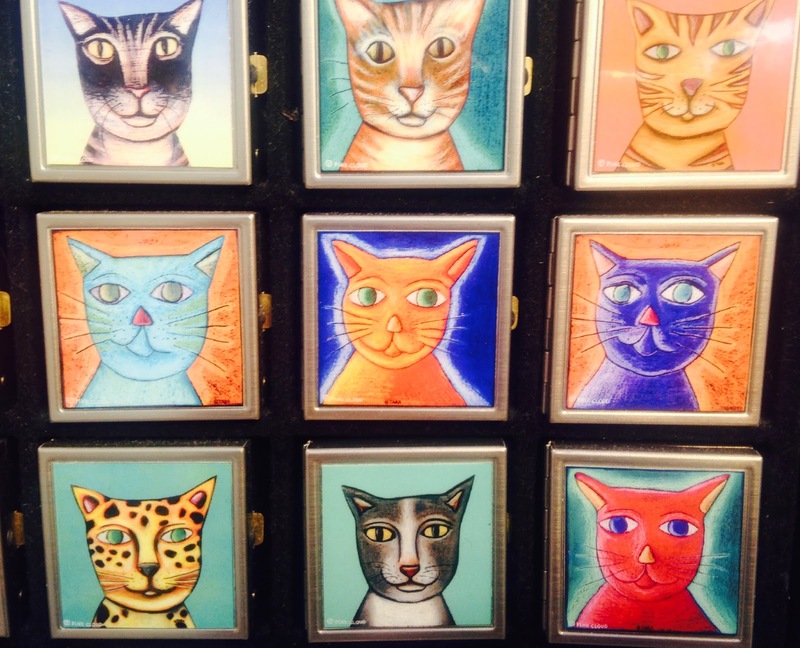 Oh, and for those of you who aren’t total fans of dogs or cats, no worries, there are over 500 items to choose from with imprints of all different animals and things like flamingos…giraffes…fish…stars…. 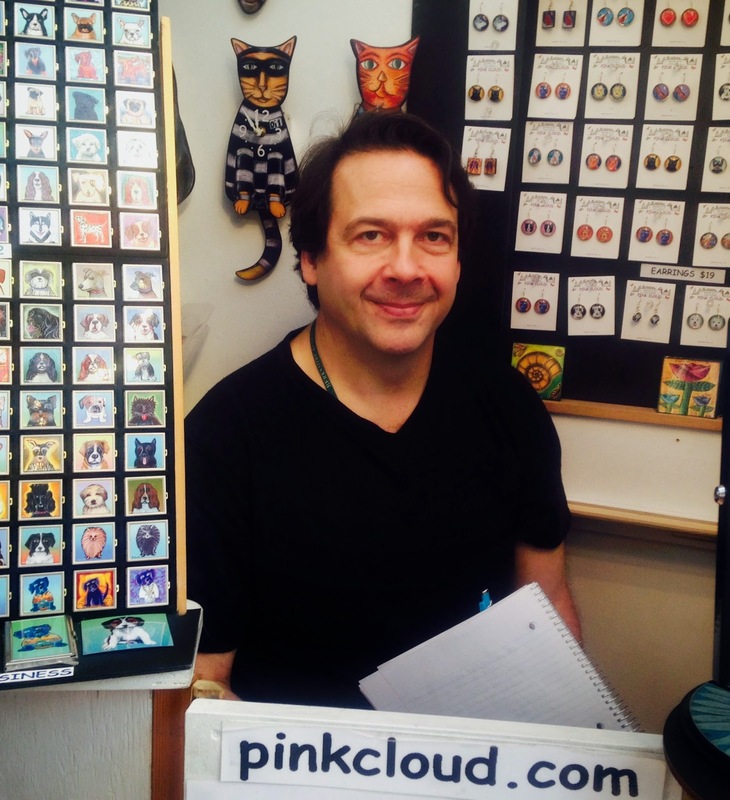 Peter knows, “People smile and they’re happy, there’s something for everyone” at the Pink Cloud Gallery.